Back in the preproduction phase for the 2K3 TMNT tv show, when Lloyd Goldfine and I came up with the idea of the Shredder actually being, secretly, an Utrom in an exoskeleton, we knew that at some point we should reveal exactly what that evil little bugger looked like. 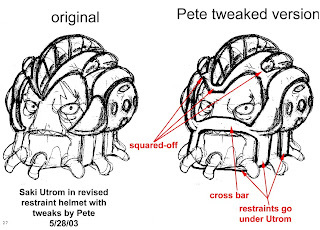 I thought that he should look significantly different from the standard Utrom, in some way which would make him stand out and look BAD. So I did these two pages of quick conceptual sketches to try to come up with such a look. There's something about the one eyed version that makes me want to yell "Shredder's not only an Utrom, he's a PIRATE Utrom! SAVY!" Was there any thought of just naming Ch'rell Krang? As a nod to the old cartoon show? DT: That probably would have confused people even more :). But there would have been allot of good jokes inherent in it :). Krang. LOL. Thanks again for the keen pictures ! Maybe one day we'll see some sketches of Ray Fillet *hink* LOL. Take care ! Was there any thought of just naming Ch'rell Krang? As a nod to the old cartoon show?" -->> ..there's a ' creep ' factor with the Utroms that always made me cringe since i was kid. Ch'rell just adds an extra aire of nervousness to that. 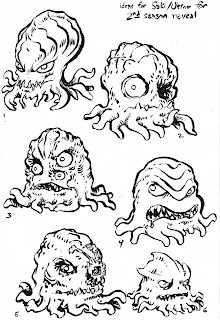 Krang was in a way more cuddly for lack of a better way to put it. Ch'rell wasn't only a creepy device, but one of the more sinister versions of Shredder. I wonder where the name "Ch'rell" is derived and inspired from. 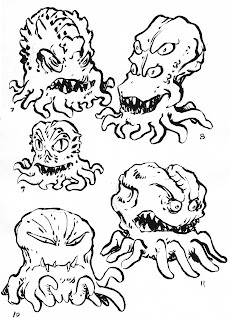 I really love these concept idea of the evil utrom, I'm not sure if you've ever seen the book of Jim Hensons Design doodles but these remind me very much of his work.